Lahore (Staff Report): A spell of heavy rain on Sunday lashed the Punjab capital, turning the weather pleasant. The maximum rainfall was recorded as 53mm, leaving low-lying areas inundated with rainwater. About 67 feeders tripped, causing suspension of electricity supply to numerous areas. According to Pakistan Meteorological Department (PMD), rain-thundershower with gusty winds is expected at isolated places in Lahore, Gujranwala, Rawalpindi, Faisalabad, Sahiwal, Bahawalpur, Malakand, Hazara, Mirpurkhas, Karachi, Hyderabad divisions, Islamabad, FATA, Kashmir and Gilgit-Baltistan. Mainly hot and humid weather is expected in most parts of the country. 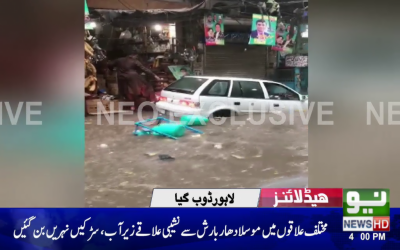 However, rain-thundershower with gusty winds is expected at isolated places in Lahore, Sahiwal, Gujranwala divisions, Kashmir and its adjoining areas.